HALBOTH, Gertrude Katharina - Age 88, of Holly, died Sunday, September 2, 2018. Services will be held 11:00 AM Saturday, September 8, 2018 at Holy Spirit Lutheran Church, 7234 Fenton Road, Grand Blanc. Reverend Nathan Allen officiating. Visitation will be held at the church Saturday from 10 AM until the time of the service. Arrangements provided by Sharp Funeral Homes, Fenton Chapel, 1000 Silver Lake Rd.,Fenton. Those desiring may make contributions to Holy Spirit Lutheran Church or Fenton Adopt-A-Pet. Gertrude was born May 4, 1930 in Heppenheim, Germany, the daughter of Adam and Lisle (Vock) Becker. She married Harry Lynn Halboth July 21, 1956 and he preceded her in death March 20, 2018. She had resided in the Holly and Fenton area for the past 20 years coming from Lake Orion and Oak Park. Gertrude worked as a seamstress at Winkleman's in Detroit and also owned and operated Kowalski Deli Shop in Ferndale for many years. She was a member of Holy Spirit Lutheran Church. She was a volunteer for hospice and Genesys Health Park. Surviving are: her daughter, Christa and husband Jim McElroy of Holly; grandchildren, Kristie Brosious of Holly and Marnie McElroy of Texas; great grandchildren, Casey and Aiden Brosious and Noah Garza; brother, Karl Becker of Flawil, Switzerland; and several nieces and nephews. She was also preceded in death by: her parents; son, David Karl Halboth; and brother, Franz Becker. Tributes may be shared at www.sharpfuneralhomes.com. To send flowers or a remembrance gift to the family of Gertrude Katharina Halboth, please visit our Tribute Store. 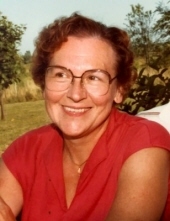 "Email Address" would like to share the life celebration of Gertrude Katharina Halboth. Click on the "link" to go to share a favorite memory or leave a condolence message for the family.